One Marks & Spencer dress seems to be going down a storm with customers recently, with it having become one of the most searched-for items on their website. 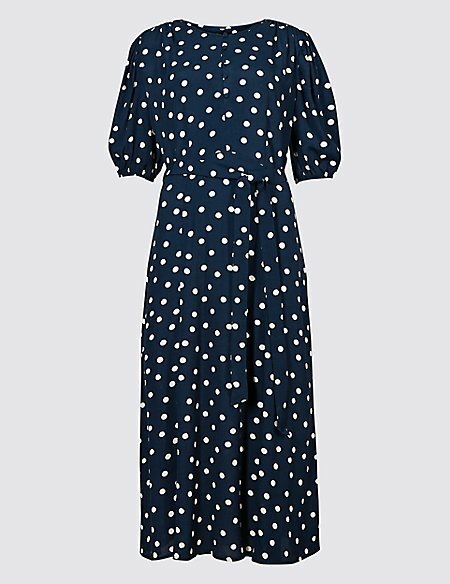 The retailer’s polka-dot dark blue midi tea dress with spotted sleeves is flying off the shelves, with the brand confirming to Glamour that it has ‘proven to be very popular’. It’s certainly easy to see why too. With a flattering, cinched in waist, and half-sleeves perfect for either summer or winter, it’s a brilliant buy. While another shopper wrote, ‘This dress is so lightweight and comfortable. It’s one of those dresses that could be brought out for years to come. Sadly however, the popularity of the midi dress has however meant that it’s quickly almost sold out – and is now only available in a size six. However, in the meantime, there are plenty of gorgeous look-a-likes of the outfit available on the high street. At ASOS, you can pick up this lovely spotted wrap dress for just £35. With the same midi length, polka-dot design and half-length sleeves, it’s a pretty great fit for the M&S dress – for a slightly more affordable cost! SilkFred are also offering up a gorgeous alternative, instead in a black colour. It’s a great match if you love the M&S dress, with an equally flattering fit and elbow-length sleeves. It’s on sale for £48 – so is slightly more expensive, but likely very much worth the investment. There are plenty of other M&S dresses proving very popular indeed with customers, including this stunning leaf print dress which sparked a frenzy on social media recently. Customers have also been flocking to this striped midi dress – which is ideal for a beachy summer holiday. So which will you be purchasing for your wardrobe?